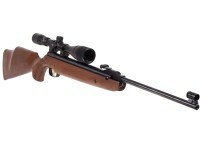 Caliber: 0.177" (4.5mm), Stock: Beech, Handle: Ambi, Scope is mounted! Beeman R9 is well-built spring-piston breakbarrel that’s ready for your backyard range right out of the box. Featuring one of the best triggers in its class, the R9 has the famed Rekord trigger, an adjustable 2-stage that breaks crisply. This trigger alone adds a lot of value towards accuracy and mechanical quality. Each R9’s fit and finish is worthy of heirloom status. 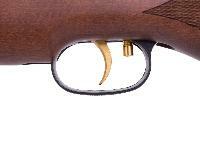 The checkering on the finely crafted hardwood stock gives you a great grip and houses the deeply blued metal barrel. 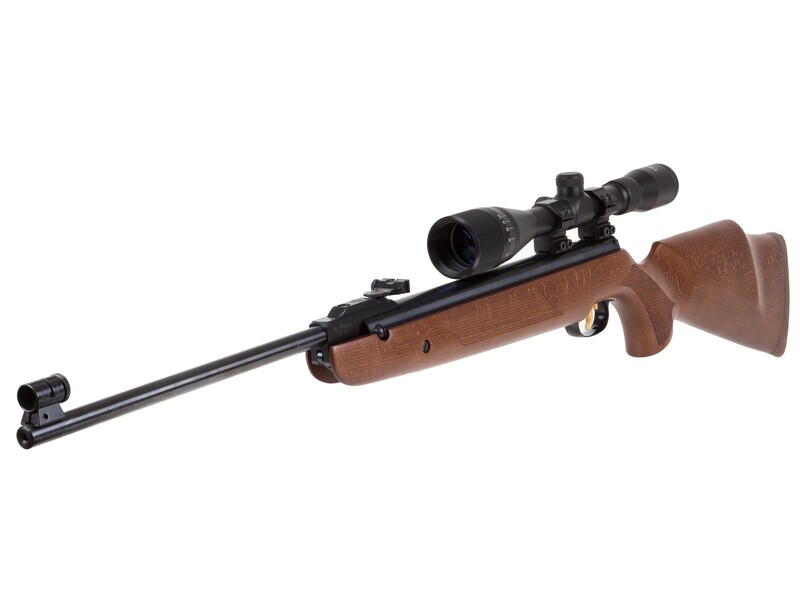 The R9 Elite Series comes with a mounted Mantis 4-12x40 AO Rifle Scope that keeps your targets nice and close, or you can remove the scope for open sight shooting. What others should know: Extremely hold sensitive. Can be accurate, but it is very difficult for me to achieve this with consistency. Maybe this is due to the rifle's relatively light weight. I have the beeman r9 .177 elite combo with mantis scope. Much more hold sensitive than my .177 tx 200 mk3 beech or .22 rws 34 classic T06 . Unless I hold the rifle in exactly the same way every shot accuracy goes away. Not forgiving. UTG 4x16x40 has a few hundred shots now. Took it out today and it seemed to have lost it s zero. Prior to this it was right on . Very accurate now with utg 4x12x40 AO scope consistent dime size 5 shot groups at 50 ft. Installed UTG 4x16x40 AO scope and have shot 3 five shot groups at 50 ft that were as big as 3 holes. Maybe the previous issue was the Mantis scope failing? Will update in a few weeks . Mantis scope went bad after about 200 shots. Bottom 2/3 of the scope went fuzzy. Returned to Pyramid. Things I liked: I was shocked by the quality of this gun. It is very well balanced and they have done a fantastic job with the quality. I felt like I was holding one of my center fire rifles. My gun seems to like the H&N pellets the best with the JSB coming in second. The gun seems to like pellets that are a little larger in diameter. I found dime sized groupings from H&N 8.64 grain 4.51 mm at 25 yards. H&N 10.65 grain 4.50 mm came in second with groupings just a little larger than a dime at 25 yards. I have shot faster springers before but I have to admit I have not shot a more accurate springer than this one. I got this gun to help eliminate pests in my orchard and have made several kill shots in the 40 - 50 yard ranges and a couple that stretched into the 60 plus yard ranges. 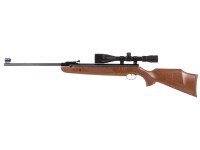 I would recommed this gun to anyone that is interested in accuracy. 830 fps with 7.9 grain crosman premiers. It seems to vary from shot to shot by around 8 fps, which really helps with its accuracy. Things I liked: A nice looking rifle. Good bluing and a handsome stock. The Mantis scope with parallax adjustment is sharp and crystal clear. I removed the front and rear sights so the targets wouldn't be blurry. At 25 yards with RWS .177 Supermag 9.3 grain flat head pellets, I got 1\2" to 3\4" 5 shot groups. I believe this is excellent for an out of the box springer. What others should know: Be sure to occasionally make sure the stock screws are nice and snug and don't be alarmed if the wood compresses. It has more than 40 lbs. of cocking effort, so keep that in mind if you plan to shoot long afternoons. Will this rifle still be available for purchase in a month or 2? 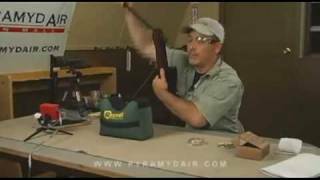 I heard one of the beeman rifles got discontinued (maybe the r1?) So I would like to know that it will be available. Thanks! Is bundled scope a mill dot scope?? 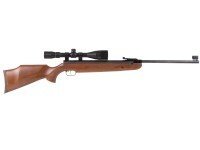 What is the make and model number of the scope that comes with this rifle? Its a bushnell banner 4x12x40mm A.O.